Hello there woohoo is the weekend. I have been so busy this week I shall be glad to have a bit of a rest this weekend only I am work again tomorrow morning for a few hours. I have been cutting and bagging up kits for two evenings now and I am finally getting there for our club on Sunday. There will a lot of lovely ladies attending and I cannot wait, I am baking tomorrow afternoon and my dearest friend and customer Carol has offered to bake an extra cake so we should be happy and calorie full. Talking about cake I am showing you a card that I loved making, it is for a friend that just got married. I have used strips of card to make the cake layers and punches to add the yummy icing. Colours used are So saffron, Very vanilla and Whisper White. The cake layers have been embossed using the Big shot and the top flowers have been made using the Boho Blossom punch. Scrunch the shapes and separate the card stock layers then add on top of each other for a full and pretty looking bloom. The cake used strips of card measuring 4.5cm wide by 8.5cm long for the bottom, then 6.5cm long for the middle tier and 4.5 cm for the top tier. 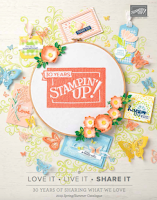 They have all been embossed using the Vintage Wallpaper and Polka Dot embossing folders. The icing was made using the 3/4”circle punch. I hope you enjoyed my wedding card I shall have to make another one for a wedding we’re attending in less then 3 weeks. EMBELISHMENTS: flat back pearls and organza ribbon. WOW Monica amazing card pls can I case this my ladies would love to make this. Beautiful as always!! your use of the circle punches to make the little swags of icing are simply brilliant!! and makes so much difference - I'm definately gonna CASE this on my next "cake" card!! This is a lovely card Monica, but it's not the vintage wallpaper embossing folder, its the square lattice one! I don't believe I got a comment from THE MONICA GALE!!! I am so honoured. I did get the idea from one of your cards you are right. Just looked back through your blog. You always have so many pretty ideas! Very pretty card. The cake looks good enough to eat. LOL. I just love this card Monica...I am going to be making some wedding cards and invitations in the coming months and love this card...thanks for sharing!!! Love this card Monica, great idea! Your card is beautiful! What a fabulous way to use your embossing folders. Looks just like the real thing!